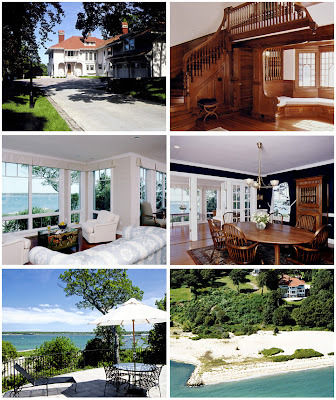 YOUR MAMAS NOTES: Not too long ago we received word from Smiley, one of our tipsters with a thing for Martha's Vineyard, who informed Your Mama that television writer Juanita Lee had listed her waterfront home in the village of Vineyard Haven on Martha's Vineyard for $12,950,000. The children prolly don't recognize Miz Bartlett's name, but surely ya'll recall the 1970s television hit The Rockford Files. Well, Miz Bartlett wrote that show along with episodes of The Greatest American Hero and The Scarecrow and Mrs. King. For those not familiar with Martha's Vineyard, it's a triangular shaped island off the coast of Massachusetts with a long history of genteel summering. Blue bloods and well to do bohemian types have been ferrying to Martha's Vineyard since someone figured out how to put shingles on houses. It is also the location of several Kennedy family tragedies including where in 1969 Senator Ted Kennedy had his infamous and unfortunate Chappaquiddick car crash that killed that poor Kopechne gurl, and also to where John Kennedy Jr. was flying with his fashionista wifey Carolyn Bessette and her sister Lauren when their plane plunged into the Atlantic in 1999. Miz Bartlett's summer getaway sits on Main Street over looking something called "the outer harbor" in the dry town of Vineyard Haven. Dry? Oh no! Dry means you can't buy alcohol there, which means Vineyard Haven won't be seeing Your Mama and the Dr. Cooter anytime soon. Listing information for Miz Bartlett's "Italianate palazzo" indicate it was recently underwent an extensive 3 year renovation that sensitively incorporated modern amenities and restored the custom mill work. Now babies, we don't care much for Miz Bartlett's taste in sofas, and dining room tables (and do not even get Your Mama started on those curtain valances jobs in the living room) , but we give the ladee a raucous standing ovation for spending the big bucks to restore the wonderful woodwork and window seat in the stair hall. In addition to the 6 bedroom, 6 full and 2 half bathroom main house, which property records indicate measures 6,872 square feet and the listing proudly declares has 10,000 square feet, the water front property also includes a 3,000 square foot carriage house. Your Mama takes the foolish liberty to assume that the 10,000 number comes from combining the square footage of the main and carriages houses. In addition to Miz Bartlett and the Bill Clintons who sometimes vacation there, Martha's Vineyard attracts all sorts of celebrity and Hollywood types not interested in the high octane summer scene in the Hamptons and includes Carly Simon, James Taylor, news maven Diane Sawyer, Bill Murray, Naomi Foner and Stephen Gyllenhaal (Jake and Maggie's folks), Larry David, Wes Craven is reported to own several homes, Ted Danson and Mary Steenburgen, and ex-Beatle Paul McCartney. Your Mama hasn't a clue why Miz Bartlett has chosen to sell her vacation house, but we're certain once she does she'll miss that big private beach. We know we would. From what the pictures show, she's a better screenwriter than decorator. That picayune point aside, I do so love the house and the location. This CA gal has no plans to summer at Martha's, but I can see the appeal for the East Coasters. Well, it's sure close to the ferry. Not my favorite location on the island. And I'd like the exterior a lot better minus the strangely fussy facade of the wing between the main house and the carriage house. But the hilltop position rocks, and the spread looks like a swell place for summer lounging. Very unique staircase and inglenook - is that an inglenook?? - in the front hall. Lovely. i'll take the 3k sqft carraige house, sight unseen, you folks can fight over the big house. Despite its proximity to the ferry, this is Martha's Island living at its best. Let's not forget that this is essentially a beach house, and as such the surfaces and finishes should rightly be both a little more informal and durable. But for such a showplace, the approach drive needs a little more than that sad border of bricks to accent it; it detracts from the whole experience of arrival. Although the facade is not classically symmetrical, it has a fun, quirky appeal that invites informality. The restoration of the woodwork, especially the inglenook (yes, Bentley, it IS an inglenook) is nothing short of admirable, and the dining porch is stunning. Poor Heath Ledger and family; we were just wondering about their move to "The Treehouse," and now this sad event - there's an object lesson in there for us all, children. I hear ya lgb. I'm stunned and saddened by Ledger's death. Never saw this one coming. Darn.. May he rest in peace. I wouldn't change a thing -- inside or out. Wish there were more pics. Bet it's amazing. Great place to kick back. Did find a pic of the guesthouse just for you, my dear caveman. Well,no Alessandra not that appealing actually! OK the "drapes" are from the JC Penney's catolog and the couch is a bit 1990's. I love the view, love the 1930 ish feel of the island. A bit colder than the Hampton's but not pretentious and not as hob-knobby. A Slower pace and a more traditional buildings make it a truly quaint place to spend short spurts of time. Would I pay that much?..... I don't know, I would want to see comparable property's on MV. And exactly how log the warm season? is it true they still dont have addresses on homes? oops how long is the warm season? Anon 7:43, there are enough full year residents (approximately 15,000; it swells to 100,000 during the summer months) on the island to borrow firewood from in the chilly months, and yes, Fairfield, most houses have names instead of numbers - quite quaint. It's warm enough for fishing from May through October. Thanks for the link, Sandpiper; I seem to recall a mention of a carriage house; I am assuming it's been converted to guest quarters? east coaster...is the season too short there to appeal? After ten years in southern CA, my seasonal clock is less finely tuned than it once was. I thought a proper inglenook had a fireplace. Is there one there? Or is my Tanqueray-addled brain missing something? Yes, Alessandra, we stand corrected; an inglenook is a grouping of benches or other seating gathered around a fireplace or chimney. You can see from the photo looking up the front drive that there is no fireplace or chimney where that window is, just to the right of the entry door, below the tripartite window on the second floor. Mea culpa - good catch! Mama, off topic, but as I know you're a fan of the Real Housewives series, I am dying for your take and for some real estate dirt on the new NY clan. I just saw the preview episode and it actually looks decent. They all seem nuts, but that's why I watch at least. I was shocked at how nice their Hamptons homes were. I know you have your Hamptons home and such, so maybe you have some insider scoop? I never saw anything less like an Italian Palazzo in my life. This house is Arts and Crafts style outside and in. What? Compared to the Hamptons nouveau wannabes? yes, i also knew about the house numbers. lol. now, about the arts and crafts, pop goes another bubble. oops. CNN the the bubble has popped! The dryness of Vineyard Haven is no real hindrance. This house is actually quite nice, except for the furnishings. True, MV is horrendous in season. Not if you live up-island! !